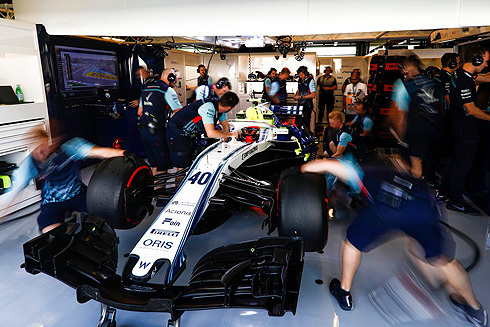 The opening Friday practice for the 2018 Abu Dhabi GP would be an uneventful session for the Williams Martini team. 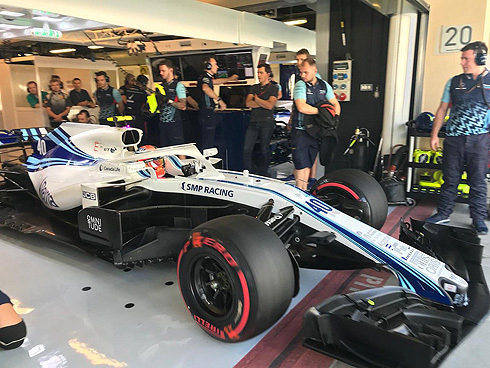 Robert Kubica would be replacing Sergey Sirotkin for this session and would focus on the running of various development parts on the FW41. He would finish 20th after having made a mistake on what was going to be his quickest lap. Team-mate Lance Stroll would finish in 15th. Both drivers would focus on runs using the hypersoft tyre. With cars coming out for their installation laps there was a mix of tyres been used with all three tyre types been run; that of soft, ultrasoft and hypersoft. With ten minutes completed the track was now empty. With twenty minutes completed no times had been set but drivers started to return. The first quick time would come from Sainz with a 1m:42.586 running on the ultrasoft tyre. Vettel would go quickest with a 1m:41.135 using the hypersoft tyre. Hamilton would move ahead with a 1m:39.675 followed now by Vettel, Sainz, Magnussen, Harley, Gasly, Grosjean and Robert. Bottas would move into second with Raikkonen and Vettel third and fourth. But Occon would move up to fourth while for Williams after their first runs they were 12th and 15th. But they would drop to 15th and 17th with an hour remaining in the session. Ricciardo was now second with Verstappen fourth while Hamilton had set a 1m:39.576 to be fractionally quicker. of the top ten only Sainz was on a tyre different to the hypersoft using the ultrasoft. At the front Verstappen would go quickest with a 1m:39.287 followed by Hamilton and Ricciardo. Ericsson would have a spin at Turn one that would see the front nose make contact with the barrier but he was able to continue back to the pits. With fifty two minutes remaining the Williams drivers were 13th and 19th. With the usual forty minutes completed the track would empty as drivers pitted to return their set of Pirelli tyres. The top ten was Verstappen, Hamilton, Ricciardo, Bottas, Raikkonen, Vettel, Ocon, Perez, Sainz, and Giovinazzi tenth. Verstappen would improve with a 1m:38.491 to remain quickest. Bottas was running on the soft tyre and was able to set a 1m:39.452 to just be behind Verstappen. Ocon was now fifth followed by Magnussen, Raikkonen, Vettel, Sainz and Grosjean tenth. With twenty minutes remaining both Ferrari's were running on the soft tyre while the Williams drivers were 15th and 20th. Ricciardo would improve to be second using the hypersoft tyre. Under ten minutes remaining in the session and drivers were on longer runs. The session would come to an end with Verstappen remaining fastest from Ricciardo, Bottas, Hamilton, Ocon, Magnussen, Raikkonen, Vettel, Sainz, and Grosjean tenth. In what was a fairly typical Friday session the Williams drivers would finish in 15th and 20th. Lance would head out for his installation lap running on the hypersoft tyre. Lance would also complete two laps prior to pitting. Lance would join his team-mate out running also on the hypersoft tyre. lance would set a 1m:42.801 to currently be ninth with just over an hour remaining. He would drop to 12th then down to 16th. He was on an improved lap setting a 1m:42.259 to be 13th. He would pit after a seven lap run. He would drop to 14th while he was in his pit. With thirty five minutes remaining he would return on a new set of hypersoft tyres. He had dropped to 17th now as others went quicker. But he would set a 1m:41.493 to jump back up to 14th dropping to 15th. Lance would pit after a seven lap run. He would return for a final run using used hypersoft tyres. Robert would be first out for the Williams team running on the soft tyre for his installation lap. Robert would pit after a two lap installation run. Robert would replace Sergey for the opening Friday practice. Robert would return this time on hypersoft tyres. Robert would set a 1m:43.838 to currently be fourth. He would drop to down to 16th as others went quicker. He had slightly improved with a 1m:43.717. But was able to set a 1m:43.051 but remained 18th. This would see him just 0.2 behind Lance but he would drop to 19th. Robert was also able to set an improved opening two sectors but would pit failing to improve after a nine lap run. With forty minutes remaining Robert would return on a new set of hypersoft tyres. He was on a better lap but would run wide after having locked up dropping to 20th. He would improve with a 1m:42.992 but would remain last. But Robert was running development parts on his car so his times were not that relevant. Robert would pit after a ten lap run. Robert would return with just a handful of minutes remaining running on the used hypersoft tyres. KUB was topping the speed traps so he was probably running low df levels and as Claire said he was on a different programme than Lance (i dont think there were a lot of new parts on his car though). “OK Robert we’ll take your suggestion. Go for a double cool. I don’t think we’ll get a timed lap in"
ps. I just love F1tv's open team radio. Edited 3 time(s). Last edit at 2018:11:23:10:36:47 by ihme. RK: "Everything went as planned, we finished our work and confirmed what we wanted." "It was ok, we did what we needed to do. We gathered important data. We knew this session was gonna be like that. Myself I would have liked to go with a better pace, but sometimes we need to sacrifice the time in the cockpit. I cannot wait for testing where we will be checking out different tyre compounds for next year." 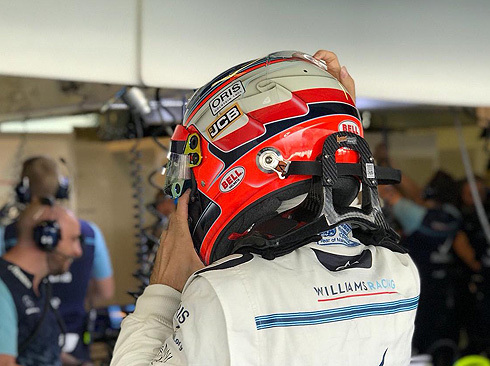 Practice sessions with Williams are not something of late that I have been excited about.